> Requirement/Experience: Thorough Knowledge of the overall merchant banking business of Nepal with hands on experience of managing DMAT, RTS, Issue Management and Underwriting, should have good knowledge of Securities Laws of Nepal, able to maintain good relationship with regulators, confident in pitching and approaching for new businesses for the merchant Banking department. Should be creative in delivering merchant banking services and should have ideas to develop new merchant banking products. Must have excellent communication skills with leadership and people management skills. 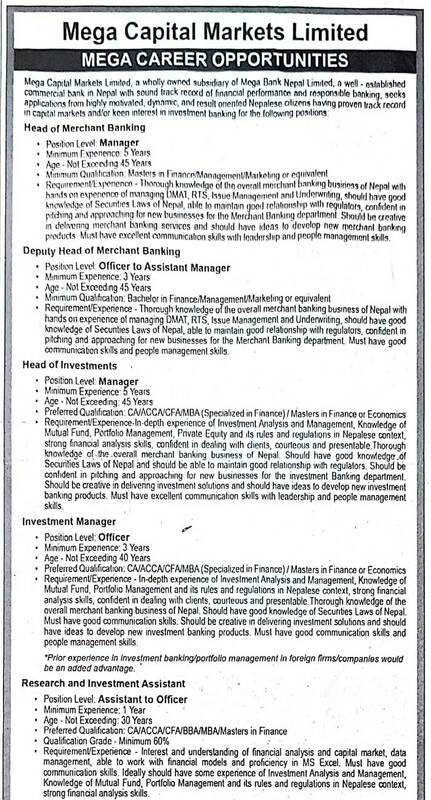 > Requirement/Experience: Thorough Knowledge of the overall merchant banking business of Nepal with hands on experience of managing DMAT, RTS, Issue Management and Underwriting, should have good knowledge of Securities Laws of Nepal, able to maintain good relationship with regulators, confident in pitching and approaching for new businesses for the Merchant Banking department. Must have good communication skills and people management skills. > Requirement/Experience: In depth experience of Investment Analysis and Management, knowledge of Mutual Fund, Portfolio Management, Private Equity and its rules and regulations in Nepalese context, strong financial analysis skills, confident in dealing and clients, courteous and presentable. Thorough knowledge of the overall merchant banking business of Nepal. Should have good knowledge of Securities Laws of Nepal and should be able to maintain good relationship with regulators. Should be confident in pitching and approaching for new business for the investment Banking department. Should be creative in delivering investment solutions and should have ideas to develop new investment banking products. Must have excellent communication skills with leadership and people management skills. > Requirement/Experience: In depth experience of Investment Analysis and Management, knowledge of Mutual Fund, Portfolio Management and its rules and regulations in Nepalese context, strong financial analysis skills, confident in dealing with clients, courteous and presentable. Thorough knowledge of the overall merchant banking business of Nepal. Should have good knowledge of Securities Laws of Nepal. Must have good communication skills. Should be creative in delivering investment solutions and should have idea to develop new investment banking products. Must have good communication skills and people management skills. *Prior experience in investment banking/portfolio management in foreign firm/companies would be an added advantage. > Requirement/Experience: Interest and understanding of financial analysis and capital market, data management, able to work with financial models and proficiency in MS Excel. Must have good communication skills. Ideally should have some experience of Investment Analysis and Management, Knowledge of Mutual Fund, Portfolio Management and its rules and regulations in Nepalese context, strong financial analysis skills. > Requirement/Experience: Should have keen interest in developing a career in merchant banking and good knowledge of Merchant Banking services. Must have Good communication, problem solving skills and should be quick learner. Preference will be given to Candidates with some previous merchant banking experience. > Requirement/Experience: Should have keen interest in developing a career in merchant banking and good knowledge of Merchant Banking services. Must have Good communication, problem solving skills and should be quick learner. Preference will be given to Candidates with previous merchant banking experience. Ideally should have some hands on experience of executing different aspects of DMAT, RTS/RTA etc. Should be familiar with Securities Laws of Nepal, able to maintain good relationship with clients, confident in dealing with clients, courteous and presentable. > Requirement/Experience: Experience with Accounting and Finance (Prepare financial Accounts, Budgets etc. ), able to work with accounting software, knowledge of Corporate Law, able to oversee/manage human resource and procurements. 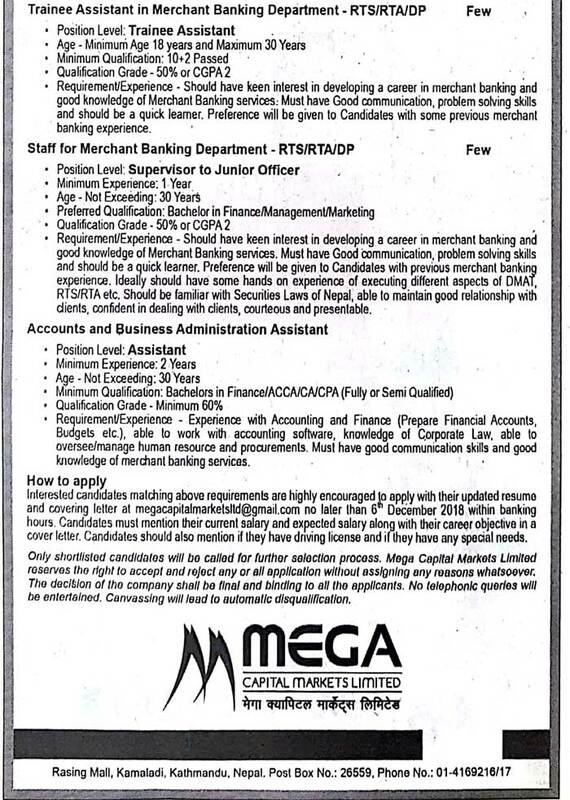 Must have good communication skills and good knowledge of merchant banking services. Interested candidates matching above requirements are highly encouraged to apply with their updated resume and covering letter at megacapitalmarketsltd@gmail.com not later than 6th December 2018 within banking hours. Candidates must mention their current salary and expected salary along with their career objective in a cover letter. Candidates should also mention if they have driving license and if they have any special needs.